Layout related settings are found at AppearanceCustomizeTheme SettingsLayout. Layout Bound offers two options, Full Width (default) and boxed. The full-width layout allows the header and footer background colors to stretch full-screen width. There is also no visible content container. Boxed offers a more traditional layout with the entire site being constrained. Disable this setting to maintain a fixed, non-responsive layout on desktop and mobile devices. 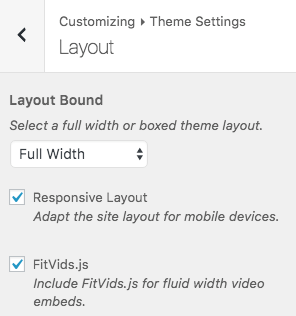 FitVids is bundled with Ultra, it ensures that your videos dynamically resize to the device they are being viewed on. The downside can be that videos in large containers are stretched beyond the size you’d like to display them in. You can either disable FitVids for a single video, or you can use this theme setting to disable the script globally. We recommend keeping FitVids enabled, however, there might be times when it’s suitable to disable globally.